With our diabetes-management-software-SiDiary you can easily import data from your Accu-Chek Smart Pix Software and use lots of advantages of statistical analysis, trend analysis and graphics to improve your therapy together with your doctor. 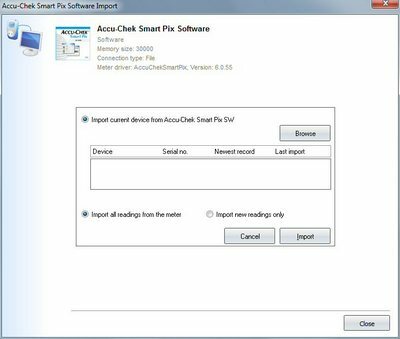 SiDiary's Accu-Chek Smart Pix Software driver imports almost all historical data. You will need only once to select the folder where the Smart Pix software stores the XML files for sharing with other software (such as SiDiary). In the settings of Smart Pix software you can also set and see the location of the patient data. In this folder you will find after saving the data then another folder called "Exch". This one contains another folder that bears the name of your PC. And finally in this folder you can find the XML files, that can be read by SiDiary and import the data in this way. This setting must be made only once, because SiDiary will remember this after reading the file(s) from that folder. The Accu-Chek Smart Pix software can be downloaded from the Accu-Chek homepage after you have registered there.